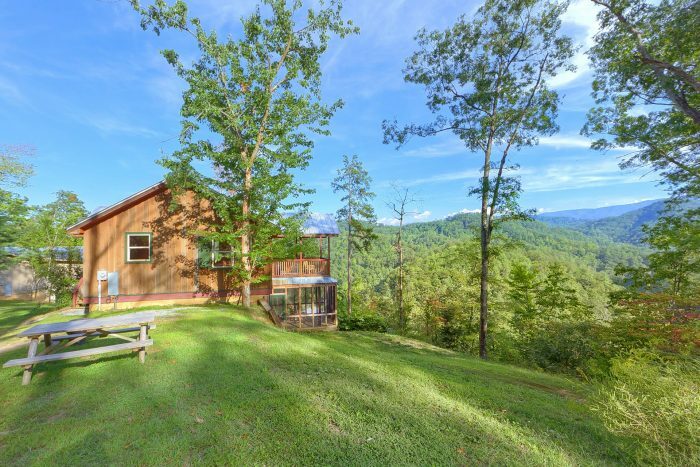 Need a cabin for rent in Wears Valley with views? 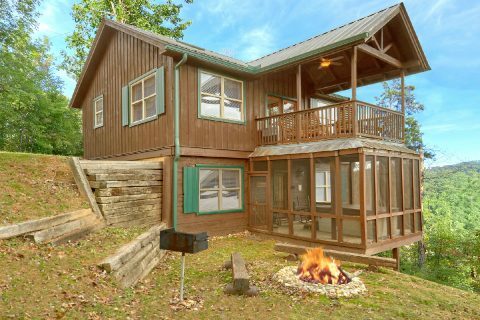 "Tip Top" offers vacationers a beautiful 2-bedroom cabin in Wears Valley with spectacular Smoky Mountain views! 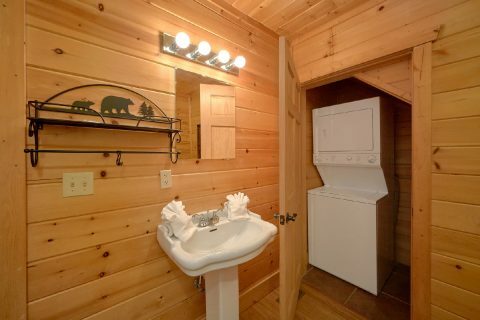 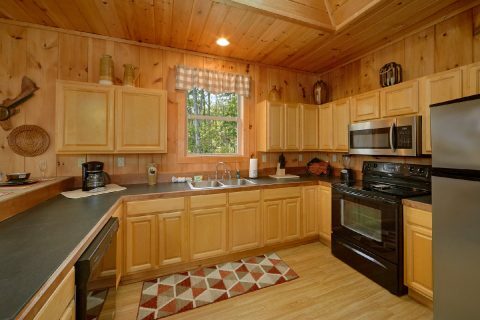 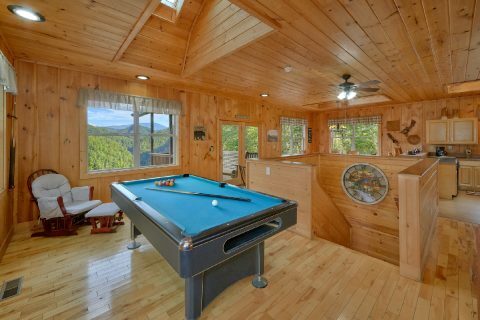 This Tennessee Smokies cabin rental is sure to capture the hearts of everyone in your family or group. 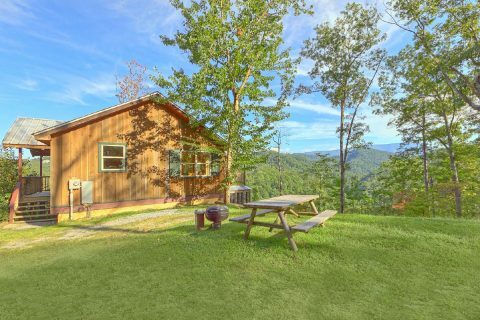 "Tip Top" cabin lies nestled in a mountain-top forest setting with a well-landscaped yard and a picnic area that overlooks seemingly endless views of the Smoky Mountains. 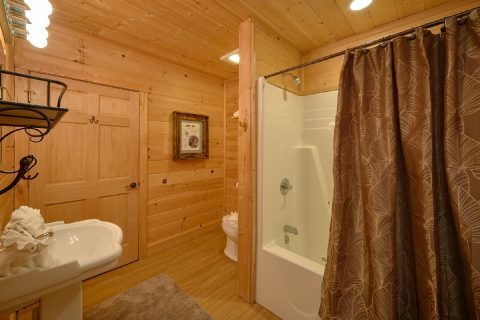 You can also enjoy the scenery from the warm waters of your hot tub. 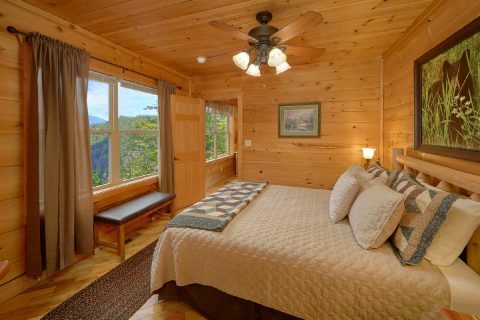 This is a comfortable 2-bedroom cabin in Wears Valley accommodates up to 6 guests, perfect for couples or families wanting a secluded mountain feeling while remaining close to Gatlinburg and Pigeon Forge activities. 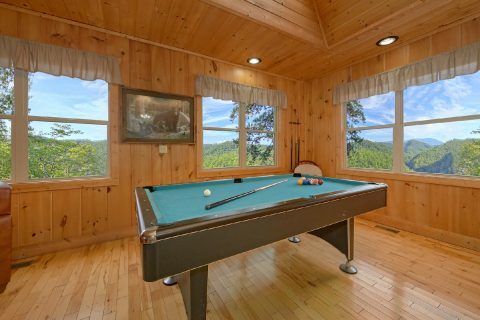 Very large panoramic windows bring the scenic beauty surrounding your cabin into the spacious living room with plush seating that doubles as a sleeper sofa. 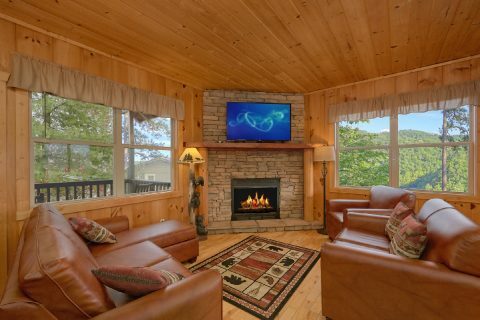 On those chilly mountain nights, cozy up next to the electric stone fireplace with a couple of mugs of cocoa and a good movie. 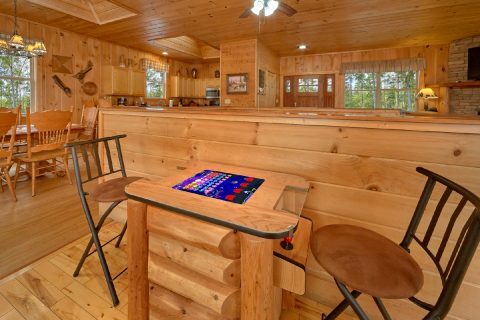 In the living room, the pool table and arcade game provide hours of fun and entertainment. 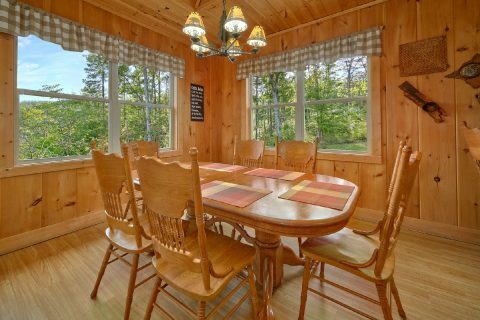 Nearby, the family dining area and kitchen with breakfast bar waits for the family to enjoy delicious meals together. 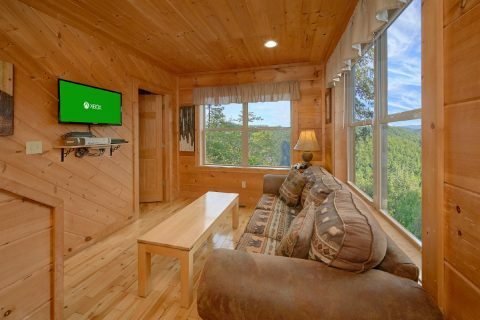 Descending to the lower level, guests find another sitting area with more panoramic windows and another television. 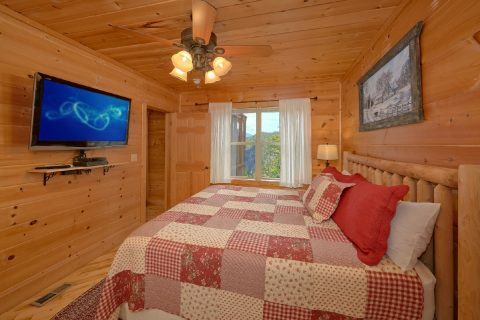 Off to your left rests a king-size bedroom with its own private bathroom and television. 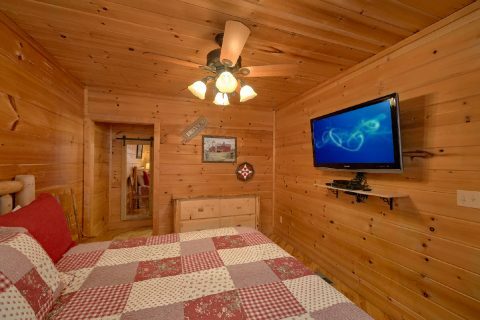 Down a short hallway, opposite the sitting area, a queen bedroom with private bath and television waits for your comfort. 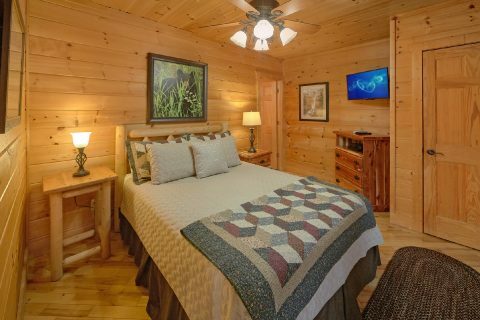 While your 2 bedroom cabin in Wears Valley rests near plenty of things to see and do, make sure you return to your cabin before nightfall to observe a breathtaking sunset from your cabin's rockers on either of the two large covered decks looking over the timber tops across the vast Smoky Mountains. 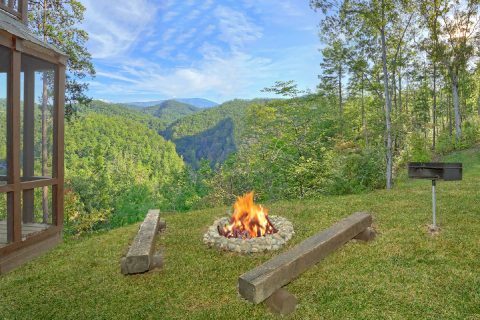 This is also a great time for a family picnic with burgers hot off the charcoal grill at your own personal picnic table, which boasts stunning views of the surrounding landscape as well. 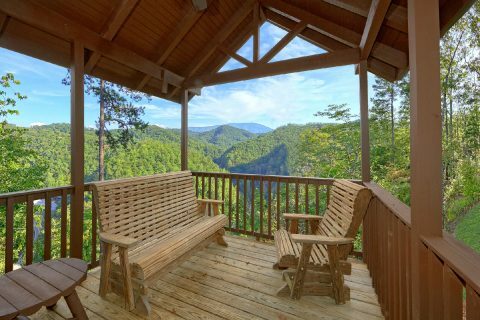 "Tip Top" lies within walking distance of "Hilltopper," "Bear Hugs," and "Higher Ground," providing the perfect location for family reunions or small church retreats needing several Tennessee Smokies cabin rentals close together. 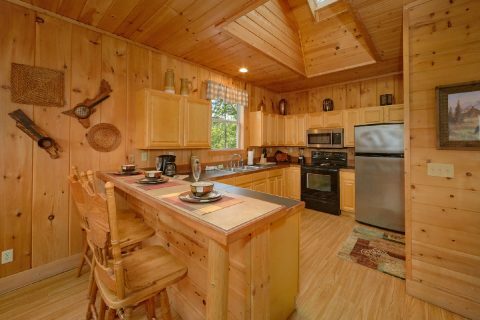 Four Wheel drive vehicles are strongly recommended for any of these mountain top cabins in the winter months. 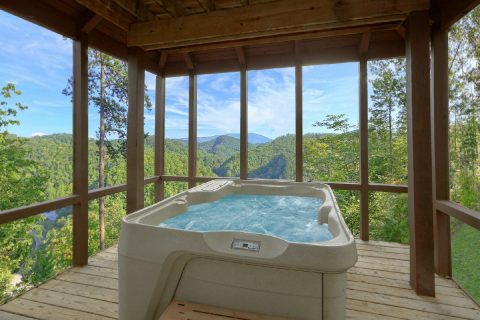 Book your cabin for rent in Wears Valley with spectacular views ONLINE with Cabins USA Gatlinburg for an immediate Online Cabin Special!